In this month of “not blogging” (in which I have blogged no less than 7 times), I have still been cooking. Taking some photos for posts and sometimes just EATING. Oh, how I love the eating. Especially when I don’t feel guilty after! 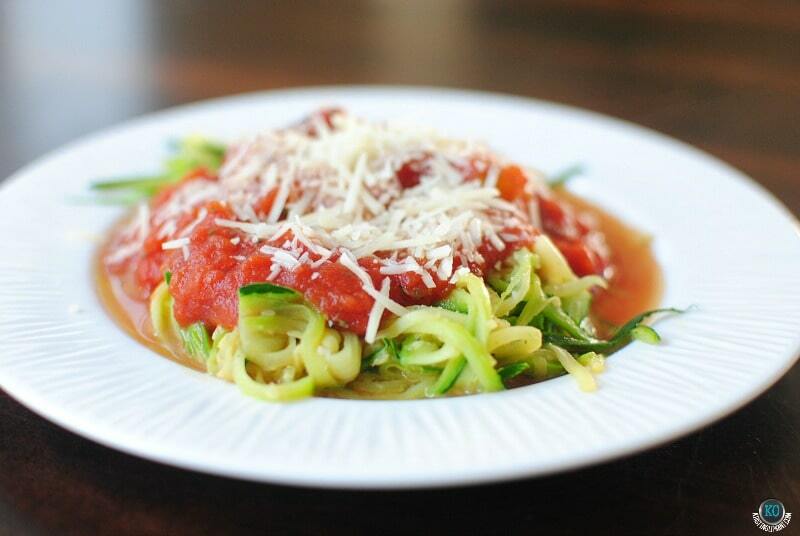 So this Easy Zucchini Pasta Recipe is perfect. Tasty. Fun to look at. (Don’t you love REAL color in food??) Perfect for pairing with sauces. And made of zucchini so when you eat a whole pumpkin cake after, you feel less guilty. 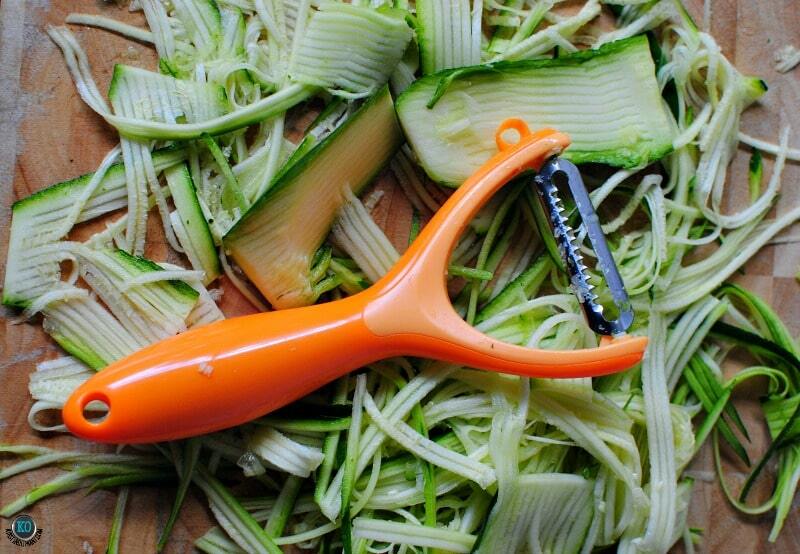 Zucchini Pasta is as simple as having the right tools. I DID once make it by slicing a zucchini into thin strips with a knife. Don’t do that. I mean, it works, but you will likely cut your fingers and take a long time and generally NEVER want to make it again. It also is really hard to get the strips to be consistent and then they will cook unevenly. This is one of those recipes for which you need a Fancy Kitchen Tool. Now you know that I generally make Stupid Simple recipes and don’t advocate Fancy Kitchen Tools. I’ll give you two FKT options. I have this. I use it. I may have ended up bleeding the last time, but generally it’s a great tool! 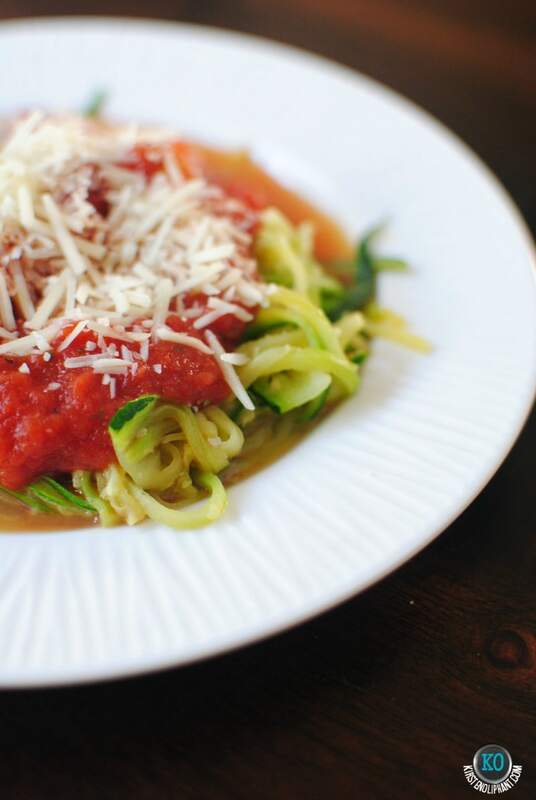 It’s fast and easy and washable and I can prep my zucchini pasta in like 5 minutes. I’ve heard WONDERFUL things about this one, and as I’m writing, it’s about half off on Amazon. This is great if you’re making zucchini pasta for more than one person. (Or you don’t want to slice your thumb open. NOT THAT I DID THAT. But I did cut my thumb a little less dramatically.) I think if I can get my family on board with zucchini pasta I will absolutely buy this bad boy. I also love using julienned carrots and other veggies in salads, so there are many things to do with this. So here’s how this works: you julienne your zucchini until it’s in thin strips. Get a few shakes of olive oil in a non-stick pan and heat to medium high. Drop in the zucchini pasta and stir to let the olive oil coat it, then stir every so often for 3-5 minutes. You can cook longer for softer pasta, but I LOVE the crunch, so I give mine just a quick few-minute blast on the stove. You might get a little browning on the zucchini and that’s okay too. So fast and so easy! Serve with any number of things. I love making a quick marinara and then topping with fresh Parmesan cheese. (If you want a super quick marinara, I use a large can of crushed tomatoes, 1/2 tsp salt, 1 T basil or Italian seasoning, 1 tsp garlic powder, 1/2 tsp black pepper, and a dash of sugar. You can let this simmer while you’re getting the zucchini pasta ready.) I’ve seen so many recipes for this on Pinterest with varying combinations and I plan to try different things and see what I can get people to eat. 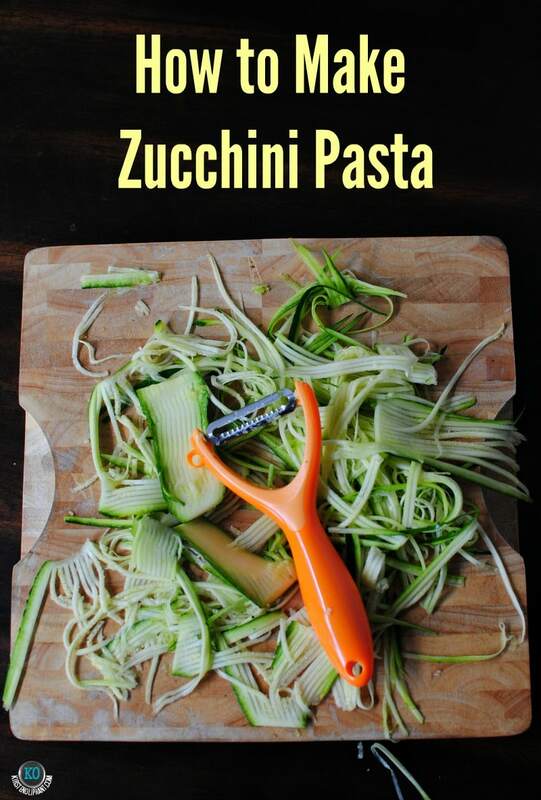 Have you made zucchini pasta? What’s your favorite way to top it? Do you have a Fancy Kitchen Tool of choice? I’ve made zucchini noodles and I love them. I have one of the little spiralizers it works okay for zucchini not so good for carrots. I would love to get myself one of the Paderno ones – I just have to decide where I can store it while not in use. Yeah, I’m kind of running out of space with the giant appliances…. Going on my must try list. Got the nod of approval from the GI. That’s so funny! I guess that’s the nice thing about simple recipes: they are being made everywhere, all the time. I like the idea of cooking it in the meat! and I want to know how the heck you made broccoli pasta?